IllegalSigns.ca has had their eye on Titan for some time, including a recent post which ecstatically awaits a possible impending bankruptcy. This recent post, I assume was due to a recent NY times article (reproduced below) about the companies problems paying it's debts, including a large sum owed to our very own MTA. What perplexes me is the sympathy we give to these companies that time and time again reap huge profits, flagrantly disregard the law, take advantage of our public thoughts and identities all under the guise of floating our precious public services. Public payphones, irreplaceable in the event of a "terrorist attack", yet entirely unused in our wireless world, are kept operational by their use as advertising shelters. Unnecessary news stand replacements were ushered in by Cemusa, declaring a cleaner vision and utility for the cities street furniture, cost defrayed by ad contracts which excluded stand owners. And most importantly, our Metropolitan Transit Authority, seemingly unable to function without the precious advertising revenue, and yet we aren't even getting paid. The worst advertising market in decades has had a devastating, and well-documented, effect on newspapers, magazines and television networks. But now another recipient of ad dollars is being hurt by the market slump at a time it can little afford it: mass transit. In recent months, a company that sells many of the ads that appear on buses and trains and in stations in New York, Boston, Minneapolis and other cities has come up short in its payments to transit agencies, citing a sharp drop in ad rates and sales. New York is among the hardest hit. The company, Titan Worldwide, fell short a total of $7.5 million in mandatory payments to the Metropolitan Transportation Authority from February through April, citing lower than expected ad sales. That would be enough to buy 16 new buses for the authority, which recently received a state bailout in the face of multibillion-dollar budget deficits over the next few years. “This is another example of the M.T.A.’s exposure to the global economic recession,” said Aaron Donovan, a spokesman for the authority, which plans to raise fares and tolls by about 10 percent in June. Titan sells ads that appear on buses and in Metro-North Railroad and Long Island Rail Road trains and stations, including Grand Central Terminal. Another company, CBS Outdoor, sells ads in the subway system, and it fulfilled its contractual requirement of making a $55 million lump-sum payment to the authority in January for all of 2009. A CBS spokeswoman, Jodi Senese, said that subway sales in New York remained strong, in spite of the overall industry slump, partly because of new types of ads in the system, like those on the exterior of subway cars. Companies like Titan and CBS make money by contracting with transit agencies and agreeing to sell ads that appear in their buses, trains and stations. The ad company agrees up front to make guaranteed payments to the transit agency or pay it a percentage of the receipts, whichever is greater. The company keeps the rest for expenses and profits. At the end of the year, both Titan and CBS may be required to increase their payments to the authority, if a designated percentage of total sales exceeds what has already been paid. Titan still owes the authority an additional amount for last year’s ad sales. The company would not say how much it owed but said it intended to make the payment this year. The authority is negotiating with Titan over its inability to make its required monthly payments, and neither side would give details of the talks. Titan’s chairman, William Apfelbaum, said that ad rates and sales have plummeted with the distressed economy, pushing the company’s sales revenue this year down about 25 percent. Titan’s problems are much the same nationwide. In Boston, Titan fell $321,000 short in its payment for March and April to the Massachusetts Bay Transportation Authority, and it has told the authority, according to a spokesman, Joe Pesatauro. “This news from Titan certainly is not helping the situation,” said Mr. Pesatauro, explaining that the authority is grappling with a projected budget deficit of $160 million for the fiscal year that starts on July 1. In Minneapolis and St. Paul, Titan paid Metro Transit, which provides bus and light rail service, about $100,000 less than the required $1 million payment for the first three months of this year, according to Bruce Howard, the transit agency’s director of marketing. He said that ad sales during the period were about 20 percent below what they were the previous year. Transit officials in Chicago, Philadelphia and with San Francisco’s Bay Area Rapid Transit system said that they had also been approached by Titan to renegotiate contract terms. The slump comes at an inopportune time for transit agencies, which have been hit hard by shrinking tax revenues and, in some cases, decreasing ridership. Ad revenues make up only a small portion of total revenues at the agencies, but transit officials have been seeking to maximize income from such sources to help relieve the pressure for fare increases. According to the Federal Transit Administration’s National Transit Database, transit agencies nationwide reported $334 million in ad revenue in 2007. That was about one percent of total operating funds. 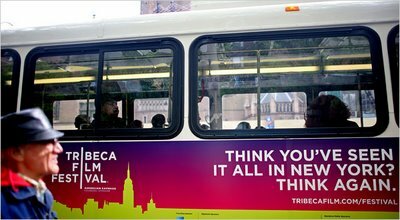 In New York, bus ad rates vary depending on what part of the city the buses travel, with rates in Manhattan being the highest, though the rates have been lowered in response to the slumping ad market. In Manhattan, an ad that covers one side of a bus typically sells for about $1,500 a month. At this time last year, the same ad sold for about $1,800, Mr. Apfelbaum said. “Warner Brothers came to us and said, ‘We want the same exact schedule as last year but we’re going to pay 20 percent less or you’re not going to get it,’ ” Mr. Apfelbaum said, referring to the number of ads placed by the entertainment company. Mr. Apfelbaum said that while there are also fewer ads being sold, his company makes sure it keeps the ad spaces on buses and trains and in stations filled, because empty space would look bad. Sometimes, he said, Titan will put up more ads than a customer has paid for, to fill what would be empty space. Titan was created in 2001 and it has worked aggressively to win transit contracts. The company received the New York bus and commuter rail contract in December 2006. It agreed to make a minimum guaranteed payment of $823 million over the course of the 10-year contract, $103 million more than the next-highest offer. The minimum payments this year come to $5.4 million a month. As part of the contract, the company also agreed to pay the authority 72.5 percent of sales each year, if that amount was greater than the minimum payment. Mr. Apfelbaum said that is the highest percentage in the industry. But Mr. Apfelbaum said he had not overbid to win the contract. “This contract, in any kind of normal time, any year in my 35 years in the business except for 2009, is a profitable contract,” he said.